Home Profile Directory Timothy Hsu Ph.D.
Dr. Timothy Hsu, dedicated teacher and active performer, serves as Colorado State University-Pueblo’s violin and viola artist-in-residence as well as its orchestra and chamber ensemble director. He is also the Pueblo Symphony’s current concertmaster. Hsu’s playing has been lauded as having “heavenly moments” (Derek Townley, The Pueblo Chieftain). His performances have led him across the globe and to concert venues such as the Kennedy Center in Washington, D.C. Throughout Hsu’s career, he has been actively involved in community engagement initiatives. He joined forces with the Pueblo Symphony and the music department at CSU-Pueblo to bring back the Youth Symphony in Pueblo, CO. Timothy has served as faculty for the Baltimore Symphony Orchestra’s OrchKids, an El-Sistema inspired music program that provides free music instruction to students in underserved communities. He was also the violin instructor for a similar program at the Baltimore School for the Arts TWIGS program. Timothy has traveled to some of the poorest regions in Acarigua and Guanare, Venezuela to teach and perform in their country’s El Sistema summer seminarios. Timothy has performed concerts at the University of Iowa Hospital and Clinics, the VA Hospital. As part of an educational outreach, he performed for the pre-school division of the Preucil School of Music. Timothy has been the recipient of the Peabody Career Development Grant and the University of Iowa School of Music Travel Funds Grant. 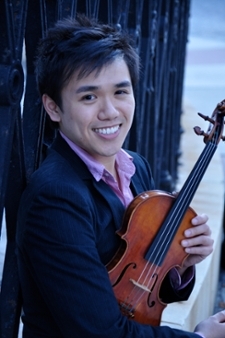 Dr. Hsu has won the MTNA Young Artist’s Competition State Division. As a chamber musician, he currently performs and teaches with the Prometheus Piano Trio at CSU-Pueblo. Timothy has also been a member of the Ft. Smith Symphony in Arkansas, the Dubuque Symphony and Waterloo Symphonies in Iowa. He holds a bachelor’s degree from the University of Central Oklahoma, received his master’s degree from Peabody Conservatory, and completed his doctorate at the University of Iowa under Professor Katie Wolfe. His former teachers include Dr. Hong Zhu and Violaine Melançon. Timothy’s favorite activity is going to new restaurants and trying new foods.